* Ebola Hysteria Affects Carnival MagicCarnival Cruise Lines advised passengers aboard Carnival Magic last night that one of their fellow passengers was a lab supervisor at Texas Health Presbyterian Hospital where two ebola patients had been treated, and the CDC had requested the woman be isolated from other passengers, although it said other passengers and crew members were not at risk. As usual, there was more to the story, but the story seems to be growing out of proportion due to news media and governmental hysteria. Bermuda is experiencing a near-direct hit by Hurricane Gonzalo tonight, and the government has asked visitors (and cruise lines) to give them a few days for clean up before arriving on the island. That has prompted two cruise ships to change course for next week. If you’ve been wondering why you haven’t heard anything about Quantum of the Seas, it’s because it has been out on a second set of sea trials in the North Sea. The plan had been to bring it to Blohm + Voss on Sunday for some final adjustments, but that’s not going to happen due to the low water level in the Elbe River. Oasis of the Seas left Keppel Verlome in the Netherlands Tuesday at the conclusion of a two-week dry dock and is now on its way back to the Caribbean. 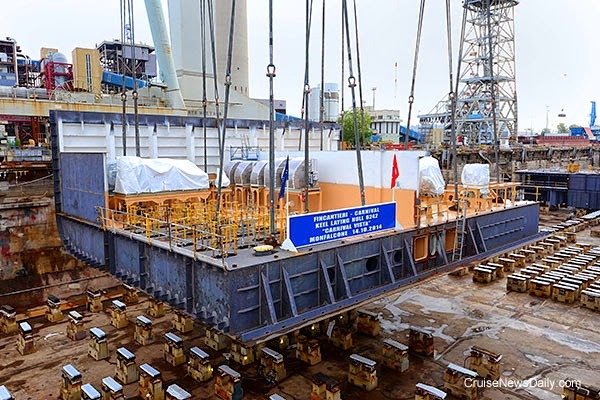 Of course the primary reason for the dry dock was the mechanical work that needed to be done on the ship, including replacement of an engine, but while the ship was out of service, Royal Caribbean took the opportunity to make a number of changes and additions aboard it. While there were many changes made, the most important of those - the one that’s going to have an effect on all passengers - is the preparation for Royal Caribbean’s Dynamic Dining concept. Oasis of the Seas arriving at Southampton. Photo courtesy of Royal Caribbean International. All rights reserved. May not be canceled or used without permission. 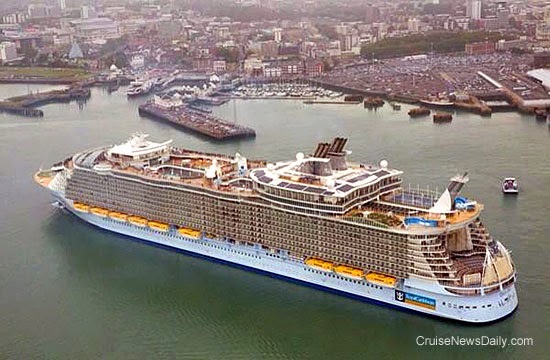 The dry dock of Oasis of the Seas got a little more expensive than Royal Caribbean had planned. The line is being fined up to 6,000 euros for violation of Dutch labor laws while the ship was in dry dock in the Netherlands. While we don’t usually report on promotional rates, MSC is offering something unusual to North American passengers who want to sail MSC Divina - the ship dedicated to the North American market - when it is in the Mediterranean next summer. Royal Caribbean's Oasis of the Seas has just completed a two-week dry dock at Keppel Verlome at Rotterdam. During the time an engine was replaced, and many new features were added and changes made in the hotel areas. The yard has released these videos of the ship's arrival in dry dock and its time out of the water. * This Norwegian President Isn’t from Norway EitherI didn’t see any exit poll results, but there must have been an election last Tuesday, because Norwegian Cruise Line has a new president today. Drew Madsen will replace Kevin Sheehan as President and Chief Operating Officer of the brand. Sheehan will continue in his role of President and COO of parent company NCL Holdings. With the acquisition of the Oceania and Regent Seven Seas brands, the management change is seen as an eventual move toward having different management at each of the brands and the parent company. * If They Order Six Ships Will They Get Eggroll?Carnival Corporation announced this evening the signing of a memorandum of understanding with the China State Shipbuilding Corporation (CSSC) to explore the possibility of expanding the cruise industry in China by way of a joint venture to build cruise ships in China. The two companies will explore the possibility of a partnership to build cruise ships that would be used in the Chinese market, and it could expand into a three-way partnership to include Italian shipbuilder Fincantieri. CND subscribers also read about the start of something big ... it's more complicated than it looks ... and paying dividends. The North Star observation platform was finally attached to Quantum of the Seas while it was in Bremerhaven last weekend between sea trials. 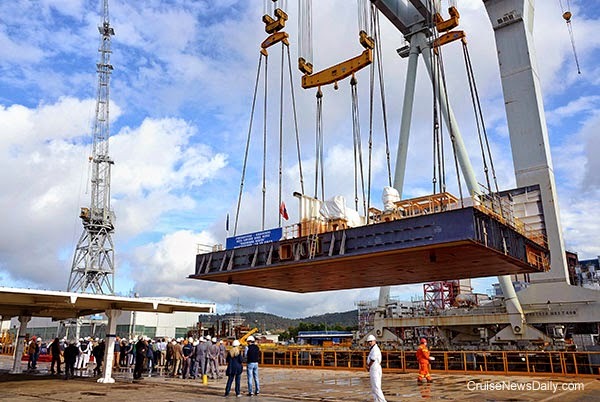 Fincantieri laid the keel today for the 133.500-ton Carnival Vista at their Monfalcone (Italy) yard near Trieste. The ship will be Carnival Cruise Lines' largest ever and is set for delivery in the spring of 2016.